Small but perfectly formed. A bit like the Brompton. Well. Christmas is nearly upon us and I am hoping that Santa leaves me a Brooks saddle for my Brompton. (I have left enough hints believe me). With the cold weather and snow, you would automatically think that Brompton users would leave their beloved folding bikes at home. Not a bit of it. I have never seen so many. Perhaps the Brompton rider is more intrepid? 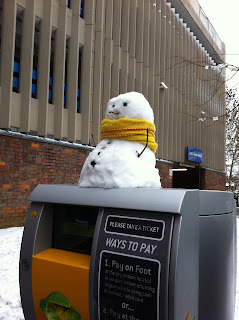 Last Saturday I happened to be out on my Brompton when the snow really came down. I felt like, Sir Ranulp Fiennes on one of his daring polar expeditions. I must say that my decision to opt for 'Schwalbe Marathon' was a a good one as they are excellent in the wet and as it happens, the snow. My C bag with rain cover has proved to be a Godsend. Quite amazing how much it can hold and even better how it sits happily on the front carrier block not at all getting in the way. I got mine from, the 'Brilliant Bikes' website. For those of you out there who need to buy the odd Brompton accessory or spare part I can wholeheartedly recommend, 'Brilliant Bikes.' http://www.brilliantbikes.co.uk/ Like their name they are brilliant. I have ordered a Brompton light set, extended seat pillar and a Brompton C bag set and all have been dispatched with speed and efficiency. I only wish that all online companies were as good! 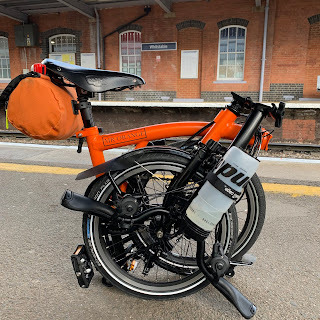 (I will try and do a review of the Brompton light set and C bag at some point as there doesn't seem to be too many out there in internet land).